Ok, the Reds season has gone down the tubes, so it's time to revisit our old friend Adam Dunn. 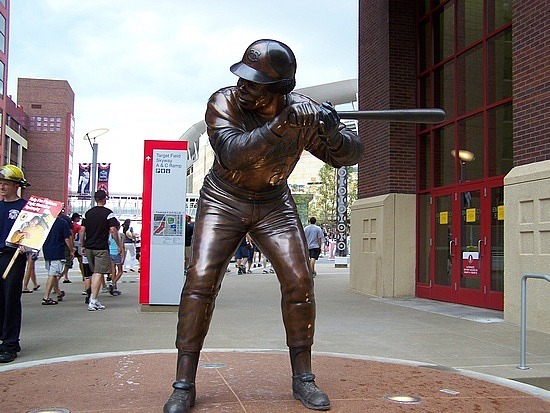 During his time in Cincinnati, The Big Donkey was the biggest lightning rod in all of baseball for the simple reason that he personified the divide between traditional scouting and statistical analysis views of the game. Traditional scouting types hated him, statistical analysis fans loved him. And, one of the first things I posted on this blog was a blurb about the likelihood that Adam Dunn would suffer an early decline. Dunn's game has always been predicated on the old-player skills of power and patience. And, Bill James first postulated that old-player skills were more susceptible to aging than the young-player skills of speed and batting average. The theory being that the loss of a step or the slowing of the bat would cause a player lacking young-player skills to fall off the cliff. For example, which player is better suited to survive a slowing bat and the loss of a step, Adam Dunn or Ichiro? Dunn is at the bottom of the acceptable spectrum in both outfield range and contact rate, while Ichiro is at the top. So, a slowing bat or loss of a step could be devastating for Dunn's production, while easily manageable for Ichiro. Anyway, I bought into that philosophy, which was a big reason why I was opposed to locking Dunn into a multi-year extension that would take him well into his 30s. Now, that said, this year has been an utter nightmare for Adam Dunn. It's been so bad that it almost defies description. I still buy into the old player skills argument, but it's difficult to imagine the wheels completely and utterly coming off the wagon like this. Is it possible? Sure, in fact the old player argument expects an earlier and faster decline, but I would have thought he would have gone from ultra productive to mediocre to massive struggles. Instead, he skipped the intermediate step and went right to the massive struggles. Regardless, I'm going to take a swing at helping the Donkey out. Once a Red, always a Red. There are countless possible reasons for Dunn's struggles. The change in leagues and resulting unfamiliarity with the pitchers, the change from playing in the field to being largely a DH, potential injuries, the weight of the contract and the corresponding expectations. It could be one or all of those factors. The more potential variables that exist, the harder it is to pinpoint the specific cause of the struggles. But, to me, the first thing that I see is a subtle change in his swing mechanics. Below are two At Bats against one of the toughest pitchers in all of baseball: Justin Verlander. The games are 11 days apart in 2011, but Dunn does the same exact thing in each of them. It looks to me like Dunn has simply fallen into a bad habit in his swing. It's easy to do and occasionally difficult to both identify and fix. But, Dunn utilizes a much more extreme bat waggle/hand position with the ChiSox than he did during his time in Cincinnati and Arizona. If you watch this video (I suggest pausing it at the 2 second mark and again at the 26 second mark), look at how long it takes Adam Dunn to get his bat up into hitting position. He lays the bat on his shoulder, actually past horizontal and somewhat pointing to the ground. And, he maintains that position for a LONG time. In fact, Justin Verlander gets past the apex of his leg kick before Dunn begins to bring the bat up into a more vertical position. Verlander is probably the hardest throwing starting pitcher in baseball, but Dunn waits until Verlander is unpacking his leg kick and beginning to drive to the plate before bringing his bat up. If you are slow to get the bat up into hitting position, then you are going to be slow to the ball. And, against MLB pitching, you can't afford to be even a fraction of a second late. In this instance, Dunn makes it work (in part because he gets an 89 mph offspeed pitch), but I really don't think that bat position is a recipe for success. And, below, here's another At Bat against Verlander, this time almost 2 weeks later, but the same bat waggle and delay in getting into hitting position. This time, Verlander gets the better of him. Stop the video at the 32 second mark and look at how far into the windup Verlander has gotten compared to the bat position of Dunn. How can Verlander be unpacking the leg kick and Dunn still have the bat parallel to the ground??? How can you hit like that??? Being slow to get the bat up into proper hitting position will very likely make him slow to the ball, but it also likely means that he is now moving his hands into hitting position at the very same time he is moving other parts of his body to trigger the swing. At times, it almost seems as if the barrel of the bat is still moving up and in towards the plate when the body begins moving forward to meet the pitch. The simultaneously moving parts to his swing could also help explain his struggles. Now, let's take a look at a few of Dunn's At Bats while he was with the Reds. First, here's a battle with one of the best starting pitchers in baseball, C.C. Sabathia. Look at Dunn's bat position against C.C. You can see that he doesn't rest the bat on his shoulder and he never gets past parallel. Also, he brings the bat up to a vertical hitting position before Sabathia begins to unpack his leg kick. So, he's a hair quicker in making his move to bring the bat up into hitting position and he has a shorter distance to travel to get into that position. And, finally, here's a look at Dunn against Wandy Rodriguez. If I was Dunn, I'd use this video as an example of what my swing mechanics should be. The bat position is much higher and only occasionally is it horizontal to the ground. And, when Wandy is at the apex of his leg kick, you can see Dunn's bat is in ideal position. 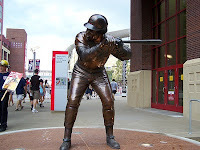 In this At Bat, he hasn't rested his hands on his shoulder and is never past parallel or pointing the bat at the ground. To me, this hand position makes him significantly quicker to the ball and puts him in better position to drive the ball. Maybe Dunn has succumbed to the curse of Old Player Skills and an early career decline. Maybe he was right all these years when he told everyone that he didn't want to play 1b or be a DH, but rather was a leftfielder. Maybe he's just scuffling with the change in leagues. But, if there was one thing I'd like to see Adam Dunn do over the final month-and-a-half it would be to stop resting the bat on the shoulder and pointing the barrel at the ground. Dunn isn't Rod Carew. He's not a handsy singles hitter who is going to slap and slash singles to all fields. Carew could afford to hit with a horizontal bat wrapped around his body. Dunn is a power hitter and needs to take a big swing to get his money's worth. It's possible that Dunn has lost a bit of bat speed, but at the very least he hasn't gotten any faster. And, as he gets older, he should be trying to get quicker and use a more direct path to the ball, but instead Dunn has gone the other way. He has dropped his hand position, forcing him to travel farther to get into proper hitting position and meet the ball. Dunn needs to go back to the hitting position he used in the Wandy Rodriguez and CC Sabathia At Bats. Stop holding the bat horizontal to the ground and get it up into hitting position earlier. When a pitcher is running it up there at 95+, you simply can't wait to get your hands into hitting position until after the apex of the leg kick: that's just too late. Get quicker to the ball. Maybe that will get him back on track this year and it will certainly become more important as he ages and loses a bit of bat speed, as he doesn't have all that much margin for error at the plate. This change might be part or all of what's ailing Adam Dunn. At the very least, if he went back to what worked in Cincinnati and Arizona, then he could cross the new hand position off the list of potential explanations for his struggles. Whatever the reason, the baseball world is just a bit more enjoyable when the Big Donkey is launching the ball into the stratosphere, so let's hope he gets back to doing just that...and soon. Kyle Lotzkar: Change the Mechanics, Save the Career? The recent injury to Kyle Lotzkar, which thankfully turned out to be a hamstring injury rather than another arm injury, got me to thinking about the best way to minimize his injury risk going forward. Now, in the interests of full disclosure, I'm not a physiologist, kinesiologist, or biologist. When you add in the fact that there is still a measure of fog clouding the relationship between pitcher injuries and pitching mechanics and this post necessarily becomes equal parts speculation and educated guessing. With that out of the way, let's get back to Lotzkar. Now, obviously, the 800 lb gorilla sitting in the room with Kyle Lotzkar is the high back elbow in his arm action. I've written about it in each and every one of my Kyle Lotzkar prospect profiles, as have many others in the blogosphere. And, unfortunately, Lotzkar has already suffered a significant arm injury early in his professional career. So, the issue becomes whether the Reds should consider tweaking Lotzkar's mechanics. Obviously, the goal would be to reduce the injury risk, but the downside is a potential decline in performance. It's not an easy decision for the Reds front office, so let's try to help them out. Before we come to any conclusions, let's take a quick, cursory look at the problem. After breaking his hands, Lotzkar utilizes an arm swing that includes bringing his elbow above the the shoulder. 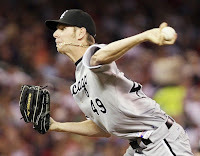 When you use the high back elbow, it makes it very difficult to get the arm up into an over-the-top throwing position. To drop the elbow from the high position and bring the ball up into an over-the-top throwing position requires an almost lasso-type arm action. And, I think it's important to understand that it is this lasso-type arm action that is the real cause for concern and the real creator of heightened injury risk for pitchers. Even just sitting at your computer, if you take a break from reading this to mimic the arm action, then you can feel the unnatural motion required to throw with the high back elbow and over-the-top arm slot. Throwing a baseball is unnatural enough as it is, but adding in this type of arm action makes it even more so. But, whenever a kid picks up a baseball for the first time he automatically throws it a certain way. And, the repetition of each throw over the course of his baseball development reinforces the muscle memory. Muscle memory is "a form of procedural memory that involves consolidating a specific motor task into memory through repetition, eventually allowing it to be performed without conscious effort." So, if you naturally use a high back elbow, then you'll constantly reinforce it with each throw in your career. Not surprisingly, that's what makes attempting to change a pitcher's mechanics when they join an MLB organization so challenging, as you are working against years and years of muscle memory. For whatever reason, as difficult as it is to change the arm swing, anyone can pick up a baseball and throw without difficulty from an over-the-top, side-arm, or submarine arm slot. So, the release point is easily changeable, but the arm action up to that point is not. As a result, I would avoid working against well over a decade of ingrained muscle memory by trying to alter the high back elbow. If the Reds forced him to do that, then they would risk a decline in performance to such an extent that he wouldn't be productive enough to pitch at the highest level. So, they *might* effectively reduce his injury risk, but end up with a healthier pitcher who simply isn't effective enough to maintain his prospect status. 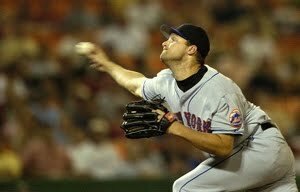 However, I really think it's worthwhile to drop Lotzkar's arm slot. To me, that would seem to be the best way to manage the twin risks: injury and performance. The lower arm slot will eliminate the problematic lasso arm action, reducing the strain on the arm, but minimize the performance risk by not forcing him to completely retrain the muscle memory in his arm action. 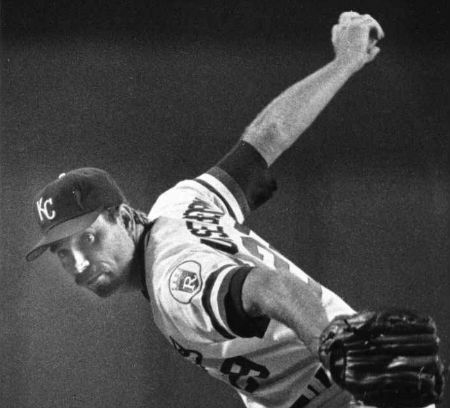 It's easy to think of MLB pitchers who featured the high back elbow and have suffered significant arm problems. For example, Mark Prior, Anthony Reyes, and Joel Zumaya all leap to mind. It's not as easy to think of pitchers who feature the high back elbow and who have not had significant arm injuries. However, two current pitchers do come to mind, one with a significant track record of durability and another with a limited track record but who strikes me as having a manageable injury risk. 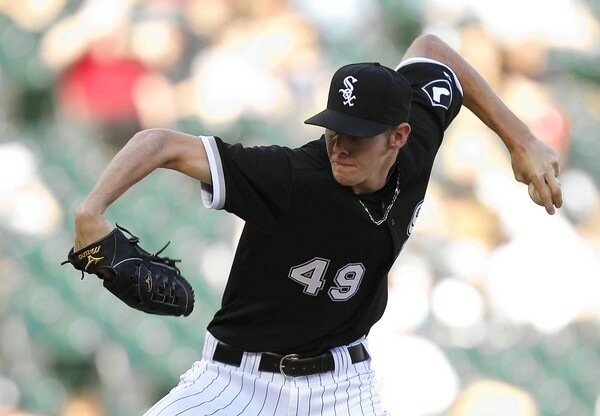 The former is Phillies pitcher Aaron Heilman and the latter is White Sox pitcher Chris Sale. But, what do they have in common? Both pitchers undoubtedly feature the high back elbow that plagues Lotzkar, but also feature something that may help them avoid the injury risk typically associated with that arm action: namely, a lower arm slot. In the first photo, you can see the high back elbow. In the second photo, you can see the lower arm slot. Even though Heilman has the higher back elbow, he doesn't have to bring his arm up into the over the top arm slot, which forecloses the need for the lasso-action. The lower arm slot largely eliminates the added strain from the higher elbow. 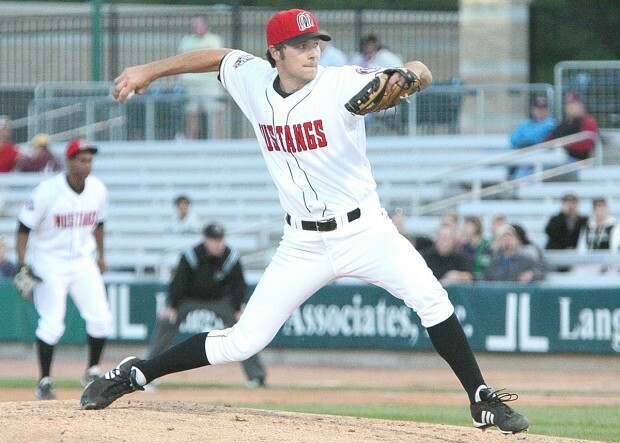 Since 2003, Heilman has thrown 65.0 or more innings 7 different times and 630.0 total innings. Additionally, he's thrown 437.2 minor league innings. And, despite all the innings, he has largely avoided significant arm injuries. He has the repertoire to start and spent most of his time in the minors in the starting rotation, but has spent most of his MLB career in the bullpen. Obviously, Heilman is just one player and accordingly can't be definitive evidence of anything, but he is something of a rarity as a high-back elbow pitcher who has logged a significant number of innings without major arm problems. And, you see a similar story with Chris Sale. In photo 1, you can see the high back elbow. In photo 2, you can see the lower arm slot. Sale is the pitcher I wanted the Reds to draft, which is surprising because I usually blanch at the mere sight of a high-elbow pitcher. But, with Sale, I just didn't see it as a red flag in part because of the lower arm slot, as that should offset some of the strain on the arm. Obviously, Sale is still young and in the early stages of his career, but so far the results are good and the injuries are non-existent. Of course, as with any pitcher, that could change on any given pitch, but so far the results are positive. At this point, it's worth mentioning one of the alleged drawbacks of a lower arm slot. There is a school of thought out there, most visibly preached by Keith Law, that a lower arm slot frequently leads to struggles against opposite side hitters. And, to an extent, I agree with Law. Opposite side hitters get a longer look at the ball coming out of the pitcher's hand, so a pitcher will need to find a weapon to effectively nullify that advantage or else be relegated to a bullpen role. However, there are examples of lower arm slot pitchers who find success in the rotation, with Justin Masterson being the latest example. Still, it's definitely something that would need to be taken into account in dropping Lotzkar's arm slot. Now, I think discussing one more pitcher is instructive. 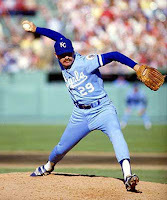 Ordinarily, I would hesitate to cite this pitcher as an example of...well...just about anything, as he defies just about all the rules and is about as unorthodox as they come. 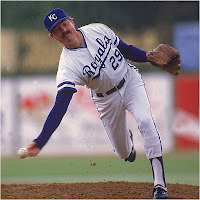 Even so, for our present purposes, Dan Quisenberry is an interesting and relevant case study. To me, Quisenberry effectively drives home the point that it's not the high back elbow alone that is cause for concern in a pitcher's mechanics, but rather the lasso-type arm action that comes from the combination of the high back elbow and an over-the-top release point. If you look at those photos, you can imagine the type of lasso action that he would have to use to get from this position to an over-the-top arm slot. Fortunately for his arm, he didn't have to use such an arm action. In fact, if you look at Quiz's arm slot, then I don't think it's a stretch to say that the use of the submarine arm slot almost REQUIRES the high back elbow. If it doesn't necessarily require it, then it certainly is a natural extension of the decision to use the submarine arm slot. But again, the real enemy here is not just the high back elbow, but the lasso arm action created by the combined usage of the high back elbow and the over-the-top arm slot. By using a submarine arm slot, Quiz didn't have to use the lasso arm action that creates a significantly higher risk of injury. It's a difficult issue without a clear cut answer. Do the Reds go for maximum performance and live with the potentially heightened injury risk? Or, do they drop the arm slot to reduce the injury risk and possibly the performance level? Or, do they try to alter his arm action completely to remove the high back elbow to reduce the injury risk as much as possible but at the cost of a heightened performance risk? Personally, I'll go with the lower arm slot. There are no hard and fast rules with pitching mechanics and injury risk. Pitchers are have different physiologies and abilities to handle stress on the arm. But, I do think there is enough data out there to support the notion that the high-back elbow leads to heightened injury risk. Given that Lotzkar is still in low-A and has a lot of development left before he reaches the majors, I don't think rolling with the status quo is the best option. If he was knocking on the door, then maybe it would make more sense to run him out there "as is" to try to get some years of production before injury (potentially) strikes. But, it seems like we are just waiting on the other shoe to drop on the injury front. To me, the best option is the middle course. Lower the arm slot, reduce the injury risk, and work to combat any potential decrease in performance level. You have to wonder if Lotzkar's career can survive another significant arm injury, which would be a shame because he has a lot of talent and a seemingly strong work ethic. Fortunately, the injury isn't a certainty, but it would be a shame to see his career end before it begins. In order to properly value a player, you have to be able to accurately quantify his on-field production. I believe it was Bill James who originally determined that "Runs" were the currency of baseball. This brought about a statistical effort to more accurately value the contributions of players, which led to statistics like WAR (Wins Above Replacement). There are three layers to this wave of player valuation. The first layer is converting the contributions of a player into a single run statistic. This has been done for both their total offensive production and their total defensive production. The offensive component of WAR is based on wOBA. So, we have to talk just a bit about wOBA. To start, wOBA isn't based on any other statistics, but rather is based on each and every outcome of a hitter's plate appearances. It uses linear weights to value all the different outcomes relative to each other. So, every outcome has a run value that is proportional to the other outcomes. So, a homer is worth more than a triple, which is worth more than a double, etc etc etc. So, every outcome is weighted and rolled into a single number. Additionally, once all the contributions are compiled, the wOBA can be converted into a single run value. Basically, you take the difference of the wOBA from league average and extrapolate it out over their number of plate appearances to get their offensive run value above/below league average. As to defense, fangraphs.com uses Ultimate Zone Rating (UZR), which is the number of runs above or below average (includes range and errors), for it's fielding component. As with some other advanced defensive metrics, the field is divided into different zones which are assigned to the relevant fielders. And, of course, the balls hit into the zones are tracked. UZR is largely based on hits in the zones, outs in the zone, and the run value of the hits. The player's performance is compared to the league average for all balls converted in the zone. Obviously, he gets credit for plays he makes above the average and deductions for the plays below the average. A run value is applied to his performance on these plays and a total run value is determined. That run value is the defensive run component to WAR. So, roughly speaking, that's how you get your offensive and defensive run totals. The second layer is converting a player's total run contribution into wins. At this stage, the offensive run values are adjusted for park effects and a positional adjustment is added. Now, conceptually, the idea of positional adjustment is one that sometimes eludes me, so I'm not going to try to explain it. In essence, a player's performance is more valuable at the premier defensive positions, so an adjustment is made to give those players a boost. Hence, Hanley Ramirez's performance gets a boost, while Albert Pujols gets a deduction. Now, converting runs to a win number is the simple part. A lot of statistical analysis has been performed to determine that generally speaking: 10 runs = 1 win. So, if a player generates +20 runs, than he's a +2 win player. Additionally, WAR is tied to replacement level. So, the benchmark is wins a player would provide over a replacement level player. Here, replacement level is an AAAA type player, which includes the type of players available as minor league free agents, the Rule V draft, and MLB bench players. Heading into the home stretch, the third layer is converting a player's win total into a dollar figure. Just how much was the player's contribution worth? First, there are 162 games per season and 30 teams, which works out to 4,860 total games. Of course, there must be a winner and a loser, so half those games will be wins and half will be loses. So, there are a grand total of 2,430 wins at play in the regular season. Now, due to the fact that every team will field at least replacement level players, who will perform at a .300 win percentage clip, every team is assigned 48 wins. So, 48 wins for each of 30 teams means that 1440 wins are not in play. That means that there are only roughly 990 wins in contention among the 30 teams. So, if you took the total salary committed to all the players in baseball and divided it by the 990 wins in contention, then you'd get the cost of a win. However, it's not that simple, as many players are cost controlled under the MLB financial structure. So, such a calculation would not reflect the market rate of a win, as players who are in their first 6 seasons or who have forgone free agency for contract security drag down the market cost of a win. You have to exclude players who are not available and focus on those who are. The price of a win is determined by market forces. As a result, you look at the free agents who signed in any given year, determine their market driven salary, and then determine how many wins above replacement they created. Once that's done, you can determine the market price of a win by (basically) dividing the total salary of all free agents by the wins generated by those free agents. So, if you had a 4-win player in 2008, he was worth $18M, which gives a more objective valuation that is not driven exclusively by the irrational decision of one or more teams. While this methodology provides a more objective player valuation, we need to take one more step. We need to make this general, league-wide valuation more specific and applicable to a specific organization. In order to do that, we need to examine the layers of revenue and how that impacts a player's unique value to an organization. Suffice it to say, a 4-win player may have a different value to the Yankees than he does to the Royals. But, we'll leave that for Part 3.